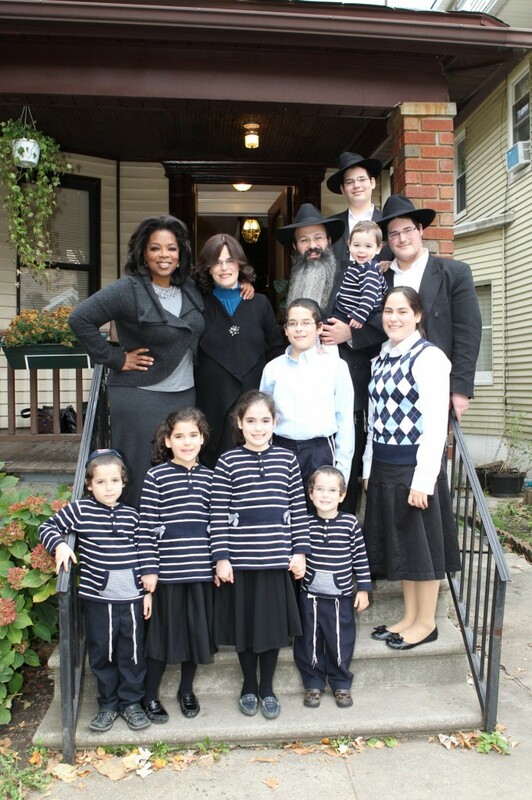 Here’s an 11-minute interview Chabad.org conducted with Oprah following her day-long visit to Chassidic Brooklyn. How moving to see the beauty of the frum world through an admiring outsider’s eyes…If you don’t have time to watch this whole 11-minute interview, you can read some of the interview highlights below. (Thanks to Esther Kohn and Bella Yehezkel for telling me about this). “I believe in many of the values and the principles that [Chassidic Jews] espouse. As I sat around the table with [the Ginsburgh family of Crown Heights] really, I had a moment of reverence for that: for the sense of family, the sense of harmony, the sense of grace and graciousness within the family. about living a life of purpose? [These kids told me] “I want to be able to give back and I want to live my life for something purposeful.” That is what is so impressive to me. “Something else I learned today is that i had always thought that women had to be subservient in this religion and this faith. But when I met with a group of Chassidic women today, one woman named Chaya explained to me “We’re not subservient. Jewish women are the foundation. We’re not the basement! We’re the foundation.” That was also inspiring to me to see how women are the foundation, and they are true partners in the relationship with their husbands. “What I didn’t realize is that this religion is so family oriented. The core of the belief system is about bringing families together…Everybody is looking for values. WHich I have to say the world could use a lot more of! “What I’m most impressed with is the value system and the way that people raise their children. What really knocked me off my feet, and you know it’s hard to make me speechless, but I went around the table and I asked the kids about… Shrek, Beyonce, and Jay-Z, and none of them knew what I was talking about. Not only did they not know who I was talking about, they said they didn’t even care. They weren’t even curious about it. “They are focusing on what matters, to them. “You know, in the United States of America we live in a culture where children spend 7.5 hours a day on average occupied by some electronic device. Either texting or watching television or playing a video game or online or on the phone. I love how shes dressed modestly and with style!!!! Wow… “Or lagoyim” what an amazing kiddush Hashem…i love that shes was so wellinformed with as many details that made it so relevant and true and just amazing..yshar coach l’chabad…gotta love them lubavetchures! Ditto! Amen! Go Oprah! Go Jewish Holy Women! Thanks Chana Jenny, I dont need to miss Oprah anymore with you on my side! !